Here you will be able to sort and see what T5 light fixture suits you best. You can see the picture, name, lumen count , bulb count, Color temperature and Wattage and all those fields are sortable! T5 Lights are fluorescent tube lights that emit light by exciting mercury atoms with electricity. These excited atoms then produce ultraviolet light that causes the material on the bulb wall (mostly phosphor) to fluoresce. You can find out more about this proces on wikipedia. The T5 standard means that the bulbs diameter is 15,9 mm but the length of these bulbs can vary and the typical lengths are 2 feet and 4 feet. 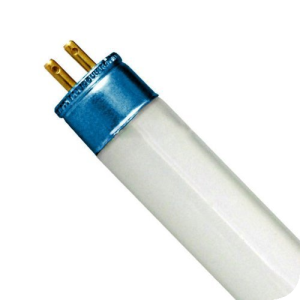 There are other fluorescent tube standards like T12 and T8 but they are less efficient and produce more heat than the T5 grow bulbs. These numbers show that T5 lights are superior to T8 lights but they are not as efficient as T5 High output bulbs that are usually used for growing plants. The HO grow lights usually have the luminous efficiency of about 88 to 105 lumens per watt and that is quite astonishing if you consider the long life span of about 20000 hours or 830 days of continuous lighting! Why choose T5 grow lights over other light sources? As I mentioned before T5 grow lights are the most efficient fluorescent tubes and they are the most efficient fluorescent light sources. This fact added with the fact that they have 20000 hour average life span makes them quite affordable as an artificial grow lights. T5 lights also have quite large light spread and they can be mounted close to your gardens canopy because they emit less heat than for example HID lights or the regular CFL bulbs. T5 lights are also good for growing because they can be bought in pre-made fixtures that can hold from 1 to 8 bulbs and can produce as much as 40000 cumulative lumen output. These pre-made t5 grow light fixtures also have the reflectors pre-installed on them so that they will reflect almost 3 times as much direct light right below the bulbs and won’t dissipate it to the sides. How to find the best T5 grow light? When searching for the best T5 fixtures you need to consider your grow room conditions and which would be the best lights for you! You need to consider the light spectrum, light intensity, size, lumen output, Wattage and even the manufacturer as all and any of these factors can influence your lamps lifespan and efficiency as well as suitability for your needs. First of all you need to measure the size of your intended growing area as there are mainly two form factors and they are the 2 foot and 4 foot ones, but you can also find 3 feet T5 lamps. You need to determine which of these two will suit your needs best and then choose one of them. You also need to think about the spacing of those bulbs as you can buy a premade fixture but you can also buy individual lights and daisy chain them together making your own fixture and spacing them as you wish. T5 Fluorescent grow tubes have an average lifespan of about 20000 hours of continuous usage, but different manufacturer bulbs differ in the efficiency losses and in the frequency of failures. It is crucial to get The best grow lights because they will be better at maintaining the initial lumen output. For the most part T5 grow light are being used as the primary source of plant lighting but many gardeners also use them for the purpose of supplemental lighting. The 4, 6 and 8 light fixtures are mainly hanged from the ceiling few inches on top of the the plants. Two and one light fixtures usually have too low lumen output to effectively grow any kind of plants but they can be used for kick starting your seedling or for supplemental lighting. As supplemental lighting T5 ar great because they can be mounted on the walls or hung sideways to give more light to the lower branches and side leaves. T5 lights are also widely used as aquarium lights for the same reasons as they are used for plant growth. With plant growth as a purpose built fixture or supplemental lighting and also aquarium lighting. T5 light are good for all of the plant growth stages because there are mainly two bulb types made for bloom and growth! T5 grow lights are fairly efficient light sources as they can get up to 100 lm/w efficiency that rivals even the High Pressure Sodium and Metal Halide lamps. They have long form factor, even spread and they emit less heat, so these T5 grow lights are the best bargain for any grower who want any kind of artificial light source. T5 grow lights get more efficient as the width of the bulb increases so you will get better efficiency from the 4 feet long bulb than from the 2 feet one but you should closely look at what manufacturers say their bulbs produce, because there are lower and higher quality bulbs available on Amazone. This efficiency can be a crucial factor for your grow as better efficiency means greater returns for the same electricity price. A typical 2 foot T5 light fixture can get from 70 to 90 lumen per watt but I will take the middle one or 80 lumen/watt ratio. The 4 feet tubes can get from 80 to 100 lumen/watt efficiency, so we will take the middle 90 lumen/watt ratio for this comparison. The 4 feet long tube will be with 5000 lumen output and it will chew up 54 W of electricity. The 4 feet long T5 tube will have 2000 lumen output and will use 24 Watts. So lets take 9*24W tubes and 3*54 W ones to get the same Wattage of 216 and lets compare the lumen output and electricity usage. These two numbers show that you can get 10 % more light just by buying the right lights so pay close attention to the lumen output of the light you are thinking of buying! The Company that makes your T5 grow light fixture or bulbs is also a crucial factor because badly made lights will not give you the efficiency you are looking for and the build quality of the fixture will determine how long it will last. The build quality will also determine how long will your fluorescent grow bulbs shine and high quality ones can have an average lifespan from 10000 to 20000 hours. These companies make quality products and you can trust that the build quality and bulb life span will be the best that you can get. T5 Lights for growing usually come in three spectral outputs that are 2700 K, 3000 K and 6400 K. These color spectrums dictate what kind of light will be produced from the bulb and the 6400 K emits more blue light but the 2700 K and 3000 K lights emit more red light. You can find out more about T5 bulb Kelvin and Spectral colors here! But why does your plants need two different spectrum bulbs? It all relies on the plants adaptation to grow in earths native environment as in the summer when the plants are growing the fastest they usually receive more full spectrum light that has more of the blue spectrum light waves. But when the autumn comes and most of the plants start to flower they get more of the red light as the light waves need to travel through the dust and other particles to get to the plant. This shifting to the red spectrum happens when the sun is lower at the horizon and it can also be seen in the evening when the sun turns from yellow to red. So as this happens every year and there are no exceptions then plants have naturally adapted to use more of the blue spectrum light when they are growing and more of the red spectrum light when they are flowering.And if you are supplementing light of growing your plants completely under the artificial T5 lights then you need to supply adequate light for the vegetative or flowering stages of your plants life. Now that you know how to find the best grow lights and what are the best T5 lights, you can choose the light that suits your needs. If you have questions or feedback Let us know on the comment section below! Hi Arnold, It car vary from light to light and there is no one formula to calculate this, but the general rule of thumb is that light diminishes two fold every feet away from the light. That means if there are 10000 lumens at the bulb level then 1 feet away there will only be 5000 lumens but another feet away there will be just 2500 lumens, so the closer you can get your plants the better. How much grow area would a 4ft 6 lamp hydrofarm cover? T5 lights usually cover the distance right above the fixture so if a light is 45 inches x 18 inches then that is the distance that your light can cover. IT also depends on the plants that you are growing as seedlings can have less light but flowering plants need more lumens. © 2019 T5 Grow Light guide. All rights reserved.